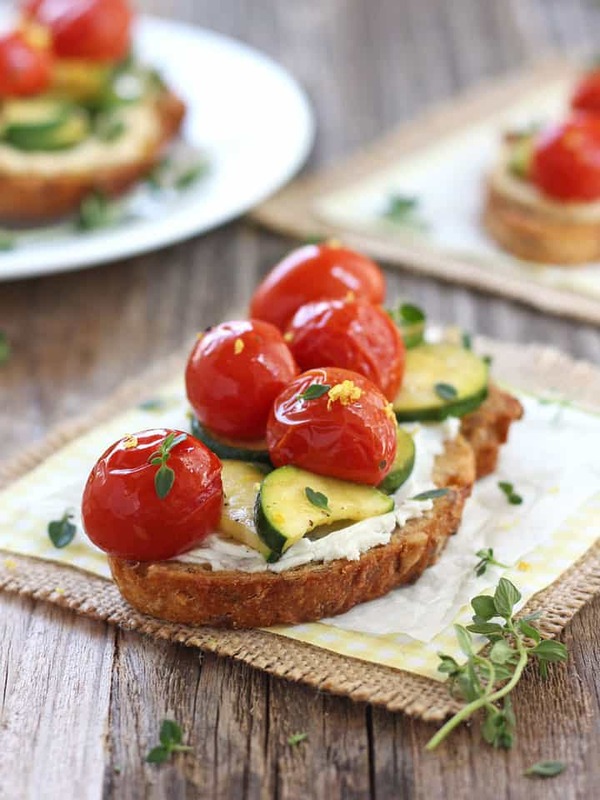 Roasted Zucchini and Tomatoes Crostini are a light dinner for two that highlights the season’s best produce. Slice them into smaller pieces for a flavorful appetizer your guests will love! Is there anything better than fresh tomatoes and zucchini on a mid-summer evening? Okay, Maple Pecan Ice Cream Cookie Sandwiches are better but we should really eat dinner and then dessert. 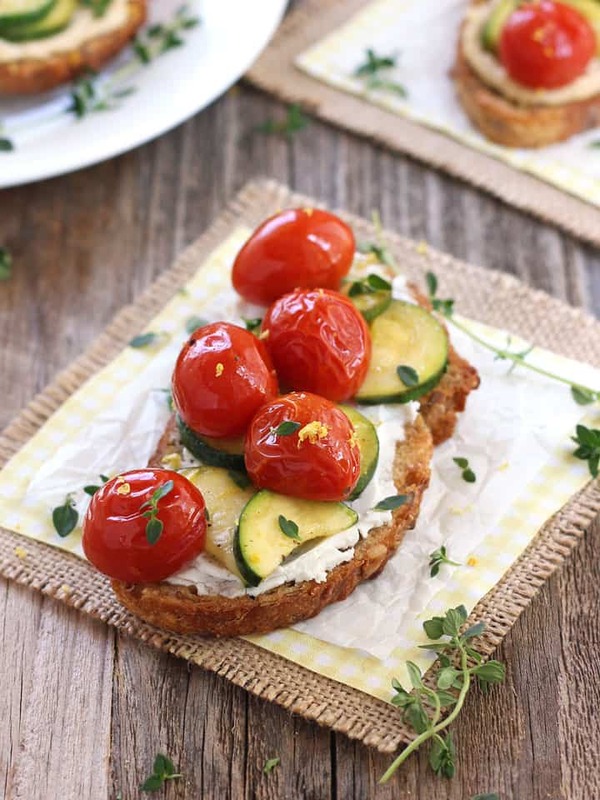 I vote for a simple yet flavorsome dinner of fresh roasted zucchini and tomatoes crostini! Now I know the weather is all kinds of H-O-T and you’re thinking she wants to roast vegetables, girl has lost her mind. Guys, you know I wouldn’t steer you wrong. First we’re using our toaster ovens so just a little extra heat in the kitchen and second it is sooooo worth it! Roasting petite grape tomatoes concentrates and intensifies their flavor. While a bit of heat turns mild zucchini into a delicate lightly golden treat. Combined with olive oil and freshly minced garlic they all transform into a sweet garlicy juicy tender flavor bomb! Seriously, you will want to take a spoon to the baking dish and gobble it all up. Especially after you’ve added a giant pop of bright flavor with the zest from a whole lemon. But by then that amazing roasted veggie aroma will have likely lured another hungry belly to the kitchen. So let’s make this into an actual meal. Starting with crusty whole grain bread slices drizzled with olive oil and toasted to crispy perfection. Next spread on a layer of something rich and creamy. Tim prefers a generous helping of tangy goat cheese. Big surprise here, I like this crostini with hummus. It’s a great alternative if you’re goat cheese adverse (that’s me) and creates a delicious vegan-friendly option too. 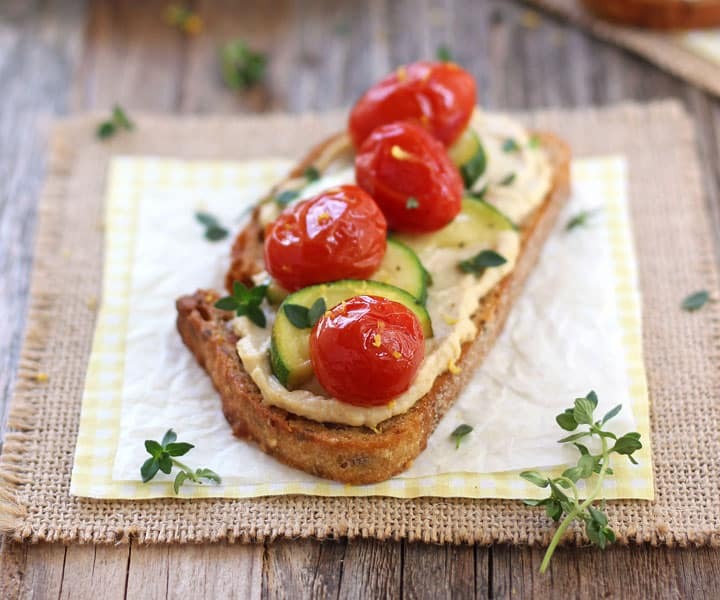 Plus you can use any leftover hummus for a Roasted Red Pepper, Carrot and Hummus Sandwich, Balsamic Asparagus and Hummus Toast or a Veggie Hummus Flatbread. 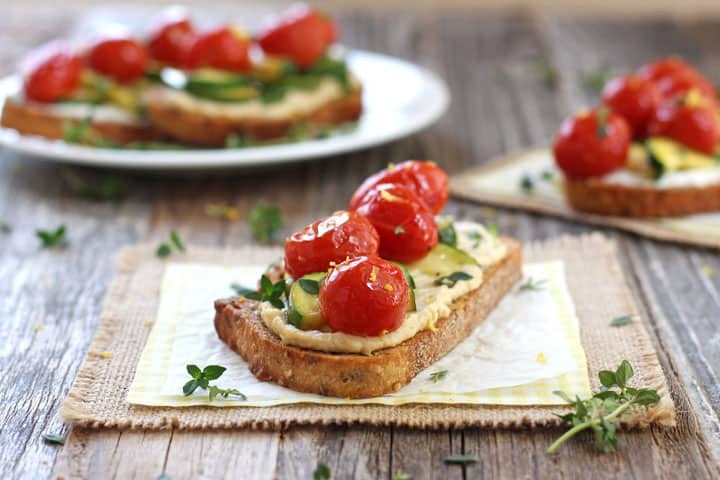 Then just top the toasts with your roasted zucchini and tomatoes along with a sprinkle of fresh herbs. Basil, mint and parsley taste quite nice. But earthy fresh thyme is the perfect complement to all of the other flavors. Okay, now that dinner’s ready let’s talk about that dessert! A slice of Easy Flatbread Fruit Pizza or Blueberry Lemon Skillet Cookie for Two with a big scoop of vanilla ice cream sounds like the perfect ending to this light summertime meal. I also shared this Roasted Zucchini and Tomatoes Crostini Recipe on Food Fanatic, stop by to print out the recipe! 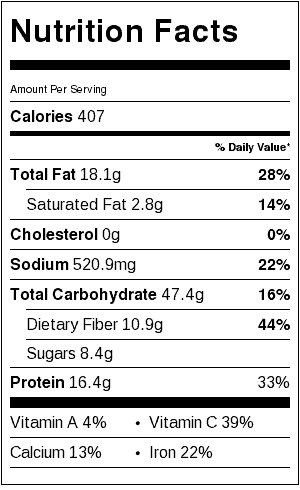 Nutritional information is an estimate for 3 Crostini made with 2 ounces of hummus. I love to roast cherry tomatoes for topping sandwiches, they are out of this world. Next time I will add the zucchini as well, this really looks so good and I can imagine how good it tastes. I was so surprised by how sweet tomatoes can become the first time I roasted a batch, “Out of this World” is the perfect way to describe them 🙂 BTW Adina I loved your zucchini series (especially that eggy pancake) so many great recipes I can’t wait to try! i do NOT like goat cheese, but i love hummus! last year we had oodles of cherry tomatoes and hardly any zucchini, and this year it’s the opposite! good thing there are creations like this that can use them both!